This section is for all press releases and latest news that is not an event at Scarthin’s Book Shop. Derbyshire photographer ASHLEY FRANKLIN, author of Derbyshire Ramblings (Walking in Circles down the Derwent Valley) has just launched a crowdfunding appeal for his latest book project The Valley that Changed the World, the first ever photo book of the Derwent Valley Mills World Heritage Site. As Ashley explains: ‘This is such an exciting project because the Derwent Valley is arguably the most significant World Heritage Site on the planet, in being the birthplace of the Industrial Revolution and the factory system. The mills also provided the blueprint for the construction of skyscrapers. ‘It’s an exciting project that has consumed me already for a year but I fear I may not be able to see it through without funds. I have already sacrificed a great deal of work time taking essential photos and even more photography is needed. As the book is being published in conjunction with the Arkwright Society, I am anxious to help the Society with the printing costs and there will also be funds needed for mounting an exhibition. Together, these will cost around £10,000. ‘As someone who has lived in the Derwent Valley for 38 years, this is a project close to my heart and to see it founder through lack of funds would be heartbreaking. ‘So, I hope I can count on your support. You can pledge anything from £10 to £300 and there are various ‘rewards’ on offer. For any pledge, your name will be inscribed in the book as a ‘thank you’. Pledge £50 and you will get a free copy of the book ( which will be sold at around £20) and an invitation to the launch plus a choice of a tour around one of three mills in the valley. Also, the more you pledge, the more raffle tickets you will receive for a prize draw, the winner earning a balloon flight for two over Derbyshire. Ashley has set a target of £7,500 to raise in five weeks. If he reaches that target, the pledge turns into a donation. If he falls short, he gets nothing. ‘If you make a pledge,’ says Ashley, ‘do tell your friends and family about this project, whether that’s via email or on Facebook, Twitter, or over a drink… share your support and help this project achieve its goal. If you need further details, contact Ashley on 01332 843908 or 07971 920382. THANK YOU to all that helped support our Crowd Funding campaign – we raised a grand total of £12,000 (£7,000 net after reward packs have been accounted for) which will cover the costs of essential building work in the bookshop. A section will be added to the website with full details, a thank you page and photographs very soon. Scarthin Books Needs Your SUPPORT! To raise 50% of the cost of essential building work to secure the structure of the premises (four steel posts on the ground floor) in order to support the ever-growing weight of stock (currently approximately 100,000 books across thirteen rooms on three floors) at Scarthin Books of Cromford, which was named as the ‘6th Best Bookshop in the World’ by the Guardian Online (2008). 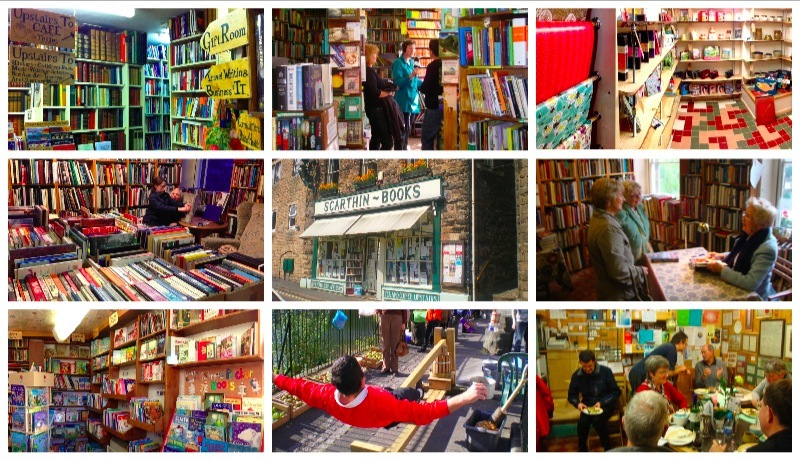 The video and photo montage above give a great overview of the bookshop. Our ethos (one of our taglines is “a bookshop for the majority of minorities”) is very much about being at the heart of our village community (another tagline is “a homely refuge and social hub”) and we regularly host events from book-signings to story-telling events to meditation groups. Last year (2014) we celebrated our 40th Anniversary. Something of a Derbyshire – or even national – institution, Scarthin Books has frequently featured in many of the ‘Top Bookshops’ lists that appear in the national and international media, and was listed by the Guardian Online as the ‘sixth best bookshop in the world’. We have also been featured as a location in several TV and film productions, most notably ‘And When Did You last See Your Father‘, starring Colin Firth. Our vegetarian/vegan cafe serves a wonderful selection of lunches, both hot and cold, and our delicious cakes are hard to resist. With a large selection of teas, coffee or cold drinks, it’s a perfect way to take a rest from browsing…and we even have a small garden you can sit in should the weather permit! During our forty years of trading the bookshop has expanded from a room below a family home to its current position of housing 100,000 books within 13 rooms, equating to over ONE MILE OF SHELVING (the proprieter and his family now live in a house behind the shop). Scarthin Books proprietor, Dave Mitchell, nearly became a civil engineer instead of a bookseller and has used his half-baked expertise to help hold up the bookshop’s 1000 feet of laden shelves with strategically placed “Acrow props” cunningly hidden behind the books. These “temporary” builders’ supports have done the job with neither creak nor groan for the past 40 years but a properly-qualified structural engineering has now advised that something more professional is needed for the next 40 years. The work he has specified involves installing four bespoke steel-tube columns resting on concrete foundations beneath the wooden shop floor. The shop and the cafe can stay open during the work, but most of the ground floor will be out of bounds for three or four weeks. The total cost of the work is expected to reach £4000 and another £1000 (at least) is likely to be lost because of restricted access to the stock. Work will begin ASAP. The shop is struggling to generate the extra funds needed for this capital improvement and even if we were able to secure a small business loan, the small margins within which we operate would make it very difficult to afford. Any small profit we do make year after year gets re-invested into the shop and its vegetarian cafe as we continue to strive to offer the ‘compleat bookshop experience’ and an unsurpassed level of customer service. We’re turning, instead, to our loyal customers and long-distance supporters in the hope that they may be able to help raise at least 50% of the cost of this urgent project. Should we receive more than our target of £2000 then we’d be able to fund the building work without the added pressure of having to cover the cost of the difference. In the event that we should raise MORE than the cost of the structural work outlined here, then other much-needed house-keeping projects could be undertaken, from paintwork to roof repairs! Scarthin Books is thrilled to announce that we have been successful in our bid to secure a James Patterson Grant, which we’ll be putting towards the cost of our current refurbishment programme (including new carpets and the opening of a brand new Music Room). Over £130,000 has been allocated to independent bookshops following the first round of applications, spread across 73 stores across the UK and Ireland. Donations will be used to fund everything from creating a children’s book festival, to running a weekly story-time, to creating and improving children’s sections. They will ensure more book events in schools, funding of an ‘on the road vehicle’ for a mobile bookshop and replacement of shelving and signage, as well as redevelopment of bookshop websites. Any independent bookshop with a dedicated children’s book section was eligible for a grant of between £250 and £5,000. Patterson is committed to bringing attention to the important contributions of independent bookshops, and he is especially concerned with inspiring children to become lifelong readers. Tim Walker, President of The Booksellers Association, says: “We are very much looking forward to seeing the grant funding being implemented by the successful bookshops. We are thrilled that so many UK and Irish indies have shown such creativity and passion in their applications. For the lucky 73 shops, the James Patterson money will make a real difference to how they reach children and encourage them to read. There are some really exciting projects that this money will help get off the ground, from converting a van into a mobile school bookshop to running a model train around the shop to get kids engaged. Many congratulations to the winners of our 40th Anniversary Prize Draws and the Bookshop Quiz. First prize of £200 worth of Scarthin Vouchers (and the namer of our soon-to-be-opened new Music Room) went to Michael from Sheffield. Second Prize of £75 worth of Scarthin Vouchers went to John from London. Third prize of £50 worth of Scarthin Vouchers went to Gill from Cromford. The Scarthin Quiz, with a prize of £25 worth of Scarthin vouchers, was won by Kathleen from Alfreton. All of our prize-winners are now in receipt of their vouchers and we look forward to seeing them at the bookshop very soon! Many thanks to EVERYONE who took part in our week-long celebrations and in particular those of you who turned up on 70s Saturday in suitable attire. Our evening party was a huge success and a wonderful time was had by all! Scarthin Books would like to offer a huge thank you to the customers and staff (past and present) that have helped turn this humble bookshop – from its birth in 1974 – into the much-loved institution that it is today. By way of thanks, we’re having a week of celebrations with not-to-be-scoffed-at prizes, culminating in an after-hours party at the shop, to which you are ALL cordially invited (just turn up from 6pm on Saturday 27th September, 70s attire optional but welcomed). There’ll be food and drink and a chance to chat to staff. The prize draw for the £200 Scarthin Voucher (and 2nd & 3rd place draws) will also take place during the party, with the lucky winner having the opportunity to NAME our NEW MUSIC ROOM (part of our forthcoming improvement programme, together with make-overs for the Art Room, Spirituality Room and Foreign Languages Annex). Our vegetarian/vegan Café has also undergone a transformation recently, so come and take a look! Any purchase made between Monday 22nd September and Saturday 27th September entitles you to entry into a free draw (an additional ticket will be given for each £20 spent). 1st prize is £200 worth of Scarthin Vouchers PLUS the chance to name the soon-to-be-opened Music Room. 2nd prize is £75 worth of Scarthin Vouchers and 3rd prize is £50 worth of Scarthin Vouchers. Cromford Apple Day 2014 will be held on Saturday October 18th between 12pm and 5pm on Scarthin Promenade. Bring your surplus apples (or pears, grapes or other fruit, which need a muslin bag or pillow-case) to be minced and pressed, together with a board and knives and time to quarter the fruit ready for efficient hand-powered processing. There will also be trees and plants for sale, hot and cold refreshments, Morris Men, musical entertainment (including Wobble and Wheeze, a fiddle duo who played at this year’s Glastonbury festival) and children activities (craft, apple dunking of course and a few other apple related games). *The Longest Apple Peel: come with your peeler or pen knife, with your apple or pick one of ours and try to beat Graham’s record! Apple pressing generates quite a bit of pulp. If you have any pigs you would like feeding with the pulp, please let us know. The pressing and entertainment are free but donations to Celebrating Cromford are welcome. For further information see www.celebratingcromford.org or contact Dave Mitchell: davescarthin@gmail.com or via 01629 823272 (Scarthin Books). 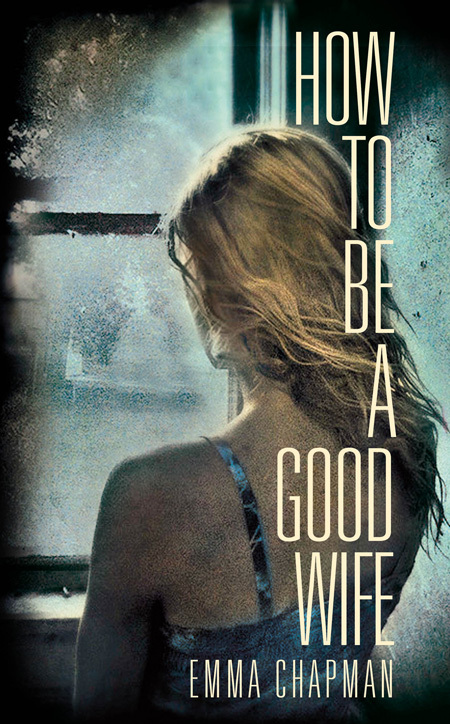 Emma Chapman, author of the brilliant new thriller How to be a Good Wife, will be visiting Scarthin Books at 3pm today (Monday 14th) as part of her epic tour to call in on as many independent bookshops around the UK as she can in a month. This July, I’m coming back to the United Kingdom to embark on an epic quest. I will visit as many independent bookshops as I can in one month, to thank the kind folks that work in them for their wonderful work on behalf of authors. Starting in London, I’ll be trekking to Penzance, finishing up in St Andrews. I’ll be stopping by to say hello to the staff and sign any books they have on hand. Auto Europe rental cars have kindly offered to loan me a car for the duration: what lovely, lovely people! Independent bookshops offer a lot more than just bricks and mortar: they are real places filled with real booklovers, who choose each book by hand and offer recommendations to their customers. Many of them offer next day delivery – just like the big A – host book clubs and author events, as well as getting even more creative with book salons and personalised gift packs. They are often at the heart of communities, offering places for people to meet and chat and form friendships. I firmly believe that we as readers have the power to make sure that these bookshops remain a part of our towns and villages. Since 2005, almost 550 bookshops across the UK have closed their doors. It’s undeniable that they face competition from online retailers, who undercut them on price, which they are able to do as they make up their money on other goods. This growth of online retail and drop in physical booksales has made it difficult for many Indies to stay afloat. However, it’s not all doom and gloom: we’re reading more than ever, and although more people now own EBook readers (50% of those surveyed in the Internet and American Life survey), people still prefer reading print books. It’s up to us, the people purchasing books, to make a conscious decision about where we buy them. There’s been a big uproar again this week as Amazon is exposed for paying less than 0.1% tax on goods sold in the UK. Perhaps if our favorite Indies had that option, they wouldn’t be going out of business so quickly. We can choose to shop local, and we can help these bookshops stay afloat. That’s what my tour is all about: encouraging readers to buy their copy of my book (and any others!) from their local independent. I think authors can do more to encourage this, and you can read more about my reasons on indie bookshop Jaffe and Neale’s blog. When my novel was first published, I conducted my first London-only Indie Bookshop Crawl, visiting 26 bookshops in one day and receiving an overwhelming response from people on Twitter and Facebook who followed my journey. I’m so excited about my journey this summer: I’m expecting a lot of driving, endless cups of tea and a real adventure! If you’re in any of the below areas and fancy popping by, I’d love to see you. If not, perhaps you could help spread the word about the tour on social media. Look forward to chatting with you – either virtually, or in person.